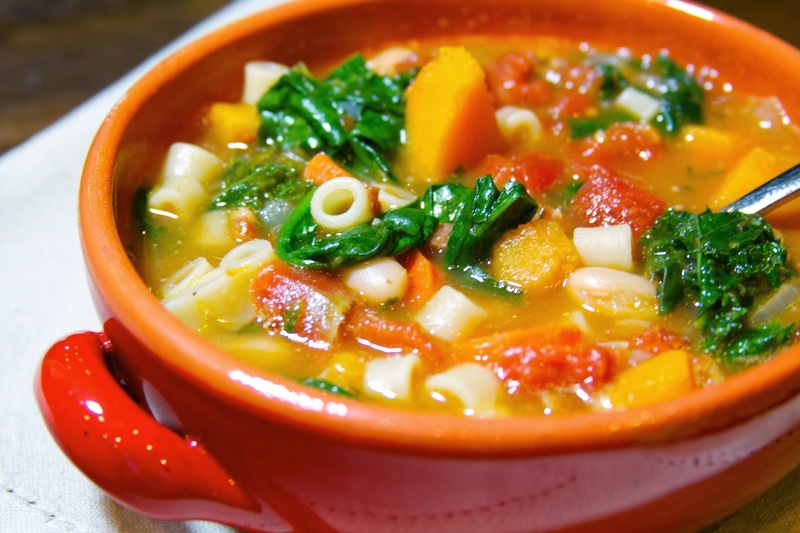 A couple of weeks ago, I was watching Barefoot Contessa on Food Network and Ina Garten made this soup on a cold, snowy day in the Hamptons and then ate it in front of a roaring fire! I immediately thought: I want that soup right now!! I also thought: I want it to snow right now! That second thought being completely implausible, of course. And not that I needed any excuse to make soup, the fact that the days are getting shorter and the nights are getting colder sure helped my resolve to make an enormous pot of Ina Garten’s Winter Minestrone. 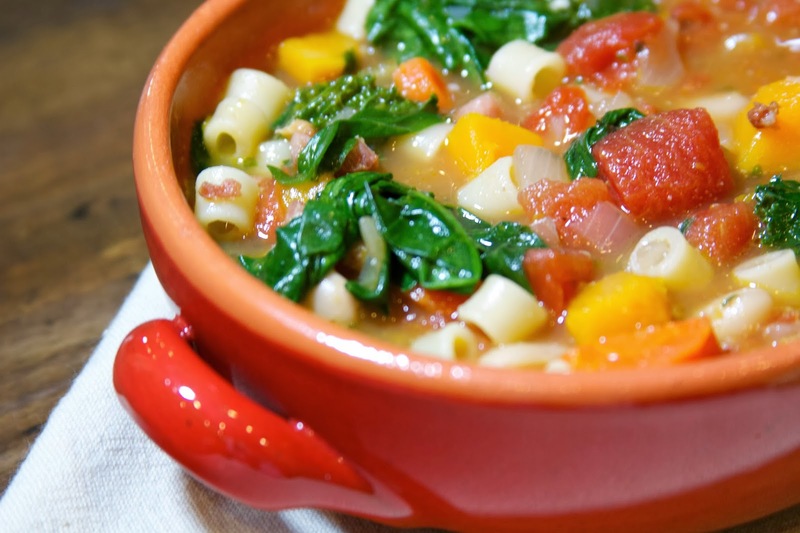 This soup was amazingly good–rich and hearty and loaded with vegetables and tender pasta; it is a perfect, complete meal! The soup is finished with a bit of white wine and basil pesto, which really adds a lot of depth of flavor. 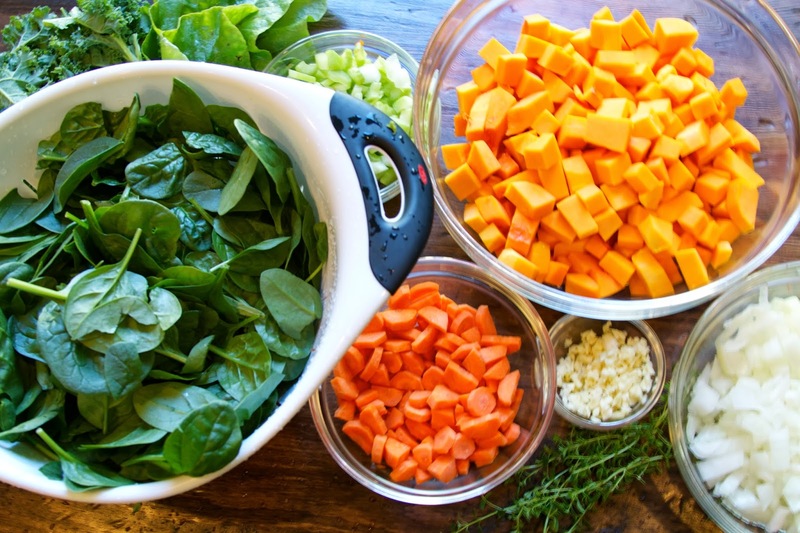 I love that this soup features butternut squash, which gives it a subtle sweetness. Plus, it is chock full of dark leafy greens! The original recipe calls for the addition of a full 10 ounces of spinach, but I used about half that amount because I had some kale and beet greens in the refrigerator that I wanted to use. I felt instantly more virtuous after eating all those dark leafy greens! Look at all these veggies! 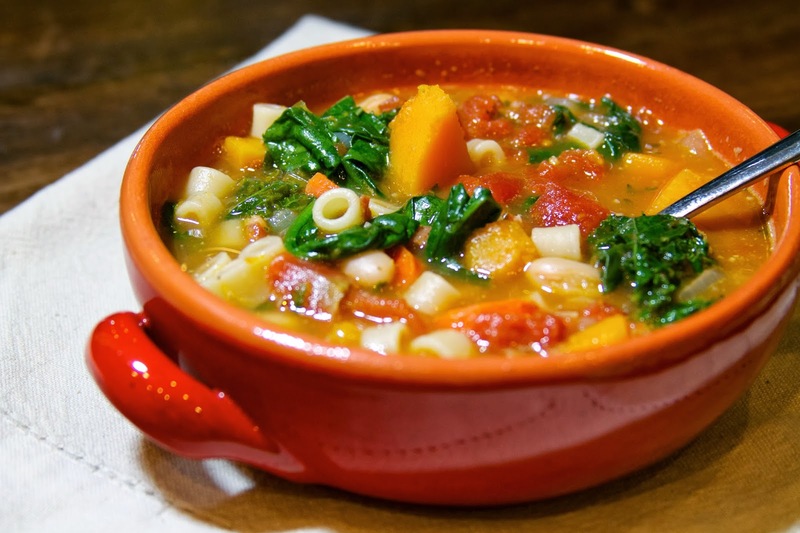 Adapted from Ina Garten, Winter Minestrone. Also found in Barefoot Contessa, “Foolproof”. I’d say that the most difficult part of this recipe is cutting and cubing the butternut squash. I rarely purchase expensive, ready-cut vegetables, but in the case of butternut squash, I think it actually might be worth the extra expense! I did use a medium sized butternut squash for this recipe, and had some leftover cubes to save for another recipe. If you do use a whole butternut squash, give yourself some extra time and be patient while peeling and cubing the squash. 1. In a large heavy pot, add two tablespoons of olive oil and the pancetta. Cook the pancetta over medium-high heat until the pancetta browns and the fat renders. Add the chopped carrots, onion, garlic, celery and butternut squash to the pot and cook until the vegetables just begin to get tender, about 10 minutes. Add the chicken stock, diced tomatoes, thyme, bay leaves, salt and pepper. The original recipe calls for the addition of 1 tablespoon of salt at this point, but I prefer to add the salt one teaspoon at a time and tasting to see if it needs more. 2. Bring the soup to a boil, then lower the temperature and simmer uncovered for 30 minutes or until the vegetables become tender. If you find that the soup has become too thick, simply add more chicken stock to the pot. 3. While the soup is cooking, cook the pasta in salted water until al dente. I used a small sized pasta (ditalini). You could also use small shells or farfalle, whatever you prefer. 4. Taste the soup and add additional salt if needed. After the vegetables are tender, add the cannelini beans, the cooked pasta and the greens. It may look at first like there are too many greens, but the greens will quickly wilt and decrease in volume. Stir in the white wine and the pesto. Full disclosure: because I always manage to forget one thing when I go to the grocery store, I had to improvise on the pesto. I made a very small amount of pesto from scratch from the last of our fresh basil. I think it turned out great and the recipe for the pesto can be found in this post. You may be tempted to forego the addition of the white wine and the pesto, but it really does adds extra depth to the flavor of this soup. I always use uncooked pasta or rice in my soups. We are total soup freaks in our house and my best soups are throwing stuff in a pot! Nothing is off limits. I pick a protein then freelance the veggies. I’m just wondering if there is a reason you cook the pasta before adding it to the soup. Love your website and recipes!! Hi Tracee! Thanks your stopping by! I absolutely love a good bowl of soup! It’s the best part about autumn and winter in my opinion! My reason for cooking the pasta separately is to prevent it from getting overcooked in the soup. I tend to cook rice in the soup and the starch from the rice will thicken the soup as well!